Stay left: Just like in Australia, in the UK they drive on the left. That’s easy to remember! Speed limits: Unlike Australia, speeds in the UK are expressed in miles per hour (mph). As a general rule, you can expect limits of 70 mph on highways and dual carriageways, 60mph on single carriageways and 30mph in more built up areas. There are different limits in between these, so watch for posted signs. Road rules: These line up mostly with the rules in Australia when it comes to overtaking, turning and other such things. Drivers are expected to use the left-most lane unless overtaking, or if that lane is designated for a left turn. Look out for box junctions, intersections marked with boxes with criss-cross yellow lines. This means that you may not enter the intersection unless your way out is clear, except for those waiting to turn right who are blocked from doing so only by oncoming traffic. Seat belt laws: Anyone travelling in a car must use a seatbelt if their seat has one fitted. Children must be in the appropriate seat or restraint for their age, height or weight. Wear a seatbelt! Licensing: Your Australian (or any other) driver’s license will be valid for use in the UK for up to 12 months, so for a short visit there should be no problem whatsoever. You won’t find the vast open spaces Aussie are used to in the UK. While there is plenty of farmland and wilderness, it is on a smaller scale than here due to the smaller size of the country. On the highways it’s not too noticeable, but when you branch off onto the smaller byways, it can be a tight squeeze, with winding country lanes and narrow village streets. Some roads will barely fit two cars passing each other, so drive slowly and carefully and be prepared to maneuver. In the northern parts of the country, such as the beautiful Scotland, winter driving can be a challenge - particularly when it comes to Aussies for whom kangaroos on the road are generally the biggest concern. If you are not confident with driving in the snow, we suggest that you avoid the north in the colder months of December, January and February. If you do drive in the cold and snow, go carefully and slowly and to check frequently that all systems are in working order and not frozen: ignition, belts, hoses, fluids etc. Carry a survival pack with (at minimum) food, water, blankets, torches, and some cat litter for traction. Bring a cellphone that will work in the UK too, and keep it charged. The stereotype of a British driver is conflicted: some envision friendly, slow old ladies pottering around town, some think of young and bored boy racers hooning around the city suburbs, while others might envisage irritable old men like Jeremy Clarkson on the M4. Like most places, the roads of the UK are filled with all sorts. A little bit of courtesy goes a long way there and anywhere, so we recommend driving with consideration for others on the road - and in particularly pastoral areas and small villages, give a wave to those you pass! If you’re sticking around in the area for a while, chances are you will see them again. 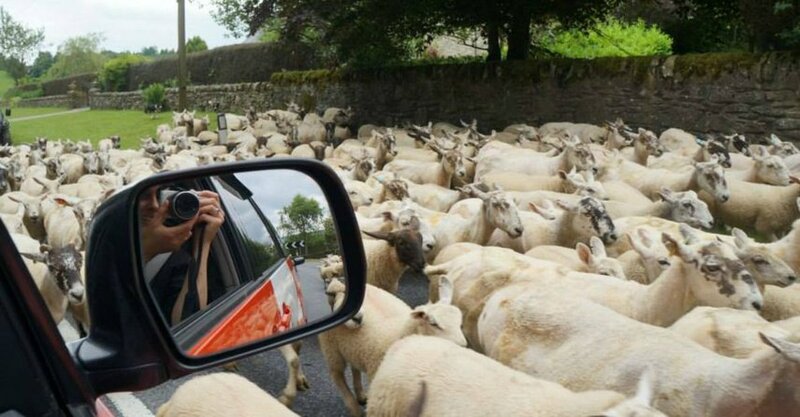 Livestock can be encountered on rural roads around the UK. It is legal for farmers to use public roads to move their cows, sheep or other animals around, so drivers must just be patient, give them space and wait for the road to clear. Driving in the UK should be a breeze for most Aussies. Just be polite, buckle up and add a GPS to your rental if you don’t want to get lost! Happy road tripping from the Airport Rentals team.